The Easter weekend 2017, marked the return of the independent transport videos cameras to the excellent ‘Kirkby Stephen and Brough Classic Commercial Vehicle Rally’ now in its 19th year. This rally, from the bus enthusiast's point of view, has to be one of the premier running events of the year. 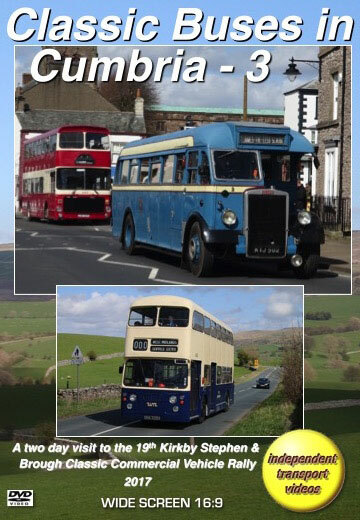 It brings the past to life as the buses and coaches run through the pretty towns of Kirkby Stephen and Brough. There is a vast array of vehicle types: including the Leyland Titan, Atlantean, Tiger, Tiger Cub, Leopard and National. From the AEC stable there is the AEC Regal, Regent, Routemaster and Reliance. Bristol was represented by the RELH and VRT, not to mention other types in the shape of the Guy Arab, Daimler Fleetline, Volvo, Seddon and Ailsa - the list goes on! Bus fleets represented include Barrow, Blackburn, Blackpool and Haslingden Corporations, Ribble, Crosville, East Yorkshire, West Yorkshire PTE and West Midlands PTE. Scottish fleets are represented with vehicles from Eastern, Western, Midland and Northern Scottish, Clydeside, David MacBrayne and Lowland Omnibus. Also featured are a number of independents. Our filming takes place on Saturday and Sunday, the 15th & 16th April 2017. Locations in Brough include the main Rally site, New Road, Main Street and along the main A685 road. In Kirkby Stephen we film along North Road, Market Street and outside both the West and East railway stations. Our cameras also ride on a number of vehicles that link these locations. On Saturday we ride on Blackpool Atlantean 362 (A362 HHG), West Midlands PTE liveried Daimler Fleetline 6225 (UHA 225H), Crosville Leyland Tiger KA226 (LFM 302), Merseyside Leyland Atlantean 1301 (DKC 301L) and Lowland Omnibus Bristol VRT 856 (NDL 656R). The highlight at the end of the day on Saturday is the ‘Road Run’. Most buses, coaches and commercial vehicles attending take to the road on a run from Brough to Kirkby Stephen and on over Ash Fell, Newbiggin on Lune, Appleby, Soulby and back to Kirkby Stephen before finishing at the Brough rally site. Our cameras have a ride on board 133 (CBV 433), a Blackburn Corporation Guy Arab III with Crossley bodywork. You will enjoy the views and sounds of the Gardner 6LW engine as we ride over the fells on a beautiful sunny evening. Filming on the Sunday takes place at the locations in Brough and Kirby Stephen where even more buses go past our cameras for you to enjoy. Our thanks go to the organises of this brilliant event. If you missed it, you can now catch up on the action with this DVD programme.